Waves Court nominations got a makeover this year. 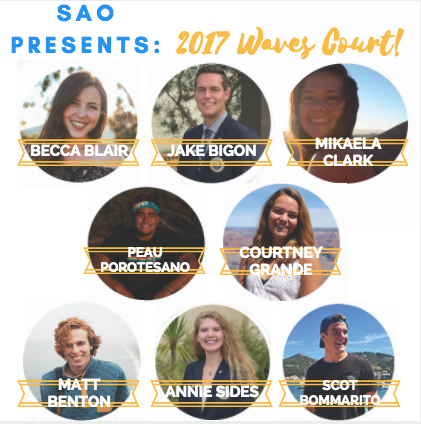 This year, the Student Alumni Organization (SAO) changed the nomination policy for Waves Court during Waves Weekend. In the past, Greek organizations nominated one member from each fraternity and sorority, by this year Pepperdine faculty nominated senior students. This year’s winners were seniors Becca Blair, a member of Delta Gamma, and Jake Bigon. Julia Sumouske is SAO’s Vice President of Marketing and coordinated Waves Court nominations. 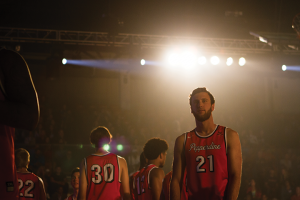 “The purpose of Waves Court is to highlight Pepperdine seniors, both male and female, that showcase the ideals of Pepperdine,” Sumouske said. Waves Court occurred during the Waves Weekend pep rally. In past years, students were nominated by fraternities and sororities, but Sumouske said SAO decided to change nominations to make Waves Court more inclusive. In years before, every Greek organization nominated a member who best represented the chapter, typically the president. Courtney Grande was one of the seniors nominated this year who showed an “outstanding involvement on campus,” according to the criteria given to faculty for nominations. Grande said she’s involved in her sorority Delta Delta Delta as an officer, a Residential Advisor for Connor, and dancer for Dance in Flight. SAO chose to have faculty nominate students because they truly know the students, Sumouske said. The students were also chosen based on how involved they are on and off campus, if they were a role model, and if they showcased what a “Wave” truly is. The change brought forward by SAO received positive feedback from students, Sumouske said. However, how nominations will be decided next year is decided by SAO’s next Executive Board. According to Sumouske, it’s likely going to stay the same, with faculty nominating students. This year, SAO decided to make a shadow box with the crowns of the King and Queen with plaques of their names and year that they won. Sumouske said that it will be on display in the Thorton Academic Center to highlight the winners. “We believe Waves Court and this recognition on the plaque will be our small way of giving back to students who have given so much to Pepperdine during their time here,” Sumouske said.